Home » » Maria the diligent women.. I am mother of three and my family consists of seven members including my husband, children, as well as parents. My husband is a fisherman fishing prawns with another four fishermen as labours. They are going to catch prawns in a one canoe which belongs to another merchant in the area. Although they earned much money, they have to share the total income in to five parts and one share goes to the owner of the canoe. I have three children. Two of them are going to school yet and the youngest child is in grade six and middle one is in grade nine. The eldest one is already employing in a small business. The time of my school life was ended at grade eight. It was facing various kinds of difficulties in house keeping and I had no time to engage in any income generation activities before. But I had been helping my mother for selling vegetable in the regional fair. As a result of that I am having more experiences in my life engaging such a small business field. We were in a difficult position facing for the difficulties such as taking children to school, especially managing the cost of living because of the low income situation in the family. All of my gold jewelry had been pawned. Considering with all these things, I decided to engage in this vegetable selling. I am an inceptive member of Sri Vimukthi Fisher Woman Organization which is affiliated with National Solidarity Movement (NAFSO). There are nine members in our small group. I have been involving to organization work for eight years. I had taken some loans from our own group and had settled. I have been assisted by Sri Vimukthi Fisher Woman Organization and my small group too. They conduct many training programmes to develop our skills and arrange educational program for us. I have taken many experiences out of the workshops that they organized. I obtained a loan of 35,000 rupees from our own regional small group called “St’ NICHOLA”. I began my small vegetable business investing the obtained loan for one and half years. 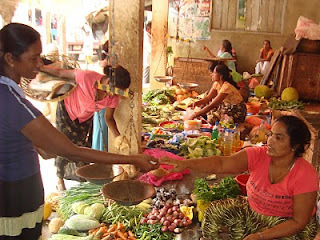 Vegetable are being bought under wholesale price from the town and selling in the regional fair from 7.30 to 12. I normally earn 500 rupees per day. I can contribute for my children’s education and preparing food for my family because I am also having income now. I was able to regain my pawned jewelry too as a result of my vegetable business. I have been discharging the loan that I got. I am saving money little by little and hope to reconstruct my house using that money in the near future. I am glad to say that we are living all together as a happy family now.